Introduction: Broad spectrums of antibiotics are widely used in the treatment of bacterial infections, particularly causing Staphylococcus aureus. These drugs have high acute renal injury (AKI) potency due to an increase in nitric oxide level. In this study, potency of nitric oxide synthase inhibition of some antibiotics was investigated according to vancomycin which was used as a reference antibiotic in renal injury. Methods and Results: Nitric oxide synthase (NOS) enzyme was purified by using 2'5'-ADP Sepharose 4B affinity chromatography from bovine kidney tissue in a single step with a yield of 3.58% and 1217- fold. Native and subunit molecular weights of the purified kidney NOS enzyme were calculated as 215 kDa and 114.8 kDa. Optimum pH, optimum ionic strength, optimum temperature and stable pH values for purified enzyme were determined as 7.5, 50 mM, 10°C and a pH range of 5.5-6.5, respectively. In vitro effects of antibiotics on purified enzyme activity were investigated by drawing Lineweaver-Burk plots. Enrofloxacin, kanamycin, chloramphenicol, gentamicin, vancomycin, cefazolin, streptomycin and ampicillin inhibited enzyme activity. IC50 values of these compounds were determined as 0.189 mM, 0.295 mM, 1.509 mM, 6.614 mM, 16.579 mM, 18.679 mM, 28.171 mM and 30.394 mM, respectively. 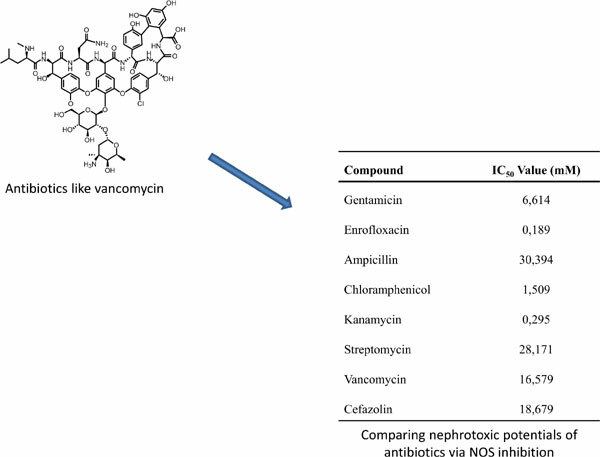 Conclusion: Enrofloxacin and kanamycin were observed to have stronger NOS inhibitory effects as compared to vancomycin and may be more reliable antibiotics for use in renal infections as an alternative to vancomycin. Keywords: Antibiotics, inhibition, nitric oxide synthase, renal injury, toxicities. Keywords:Antibiotics, inhibition, nitric oxide synthase, renal injury, toxicities. Abstract:Introduction: Broad spectrums of antibiotics are widely used in the treatment of bacterial infections, particularly causing Staphylococcus aureus. These drugs have high acute renal injury (AKI) potency due to an increase in nitric oxide level. In this study, potency of nitric oxide synthase inhibition of some antibiotics was investigated according to vancomycin which was used as a reference antibiotic in renal injury.